A baby suffered brain damage when his father carried him upstairs in "close to a blind panic" after he went limp while being fed, a family court judge has concluded. The eight-week-old boy's head moved in an "alarming" fashion as his father leapt up steps to alert his mother, Judge David Willans decided. The baby has been left with "sight damage" and his future is "uncertain", said the judge. Detail of the case emerged in a ruling published by Judge Willans following a private hearing at West London Family Court in Feltham. Social services bosses had asked the judge to decide how the boy, who is approaching his first birthday, suffered brain damage so they could make decisions about future care. The judge has not named the family involved. He said bosses at Hillingdon Council had responsibilities for the boy's welfare and had begun litigation. Judge Willans decided that the man had "inadvertently" shaken his son's head and caused brain damage. He said he was satisfied the baby had not been deliberately shaken. The judge said the family had been "torn apart". 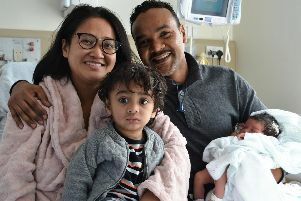 Restrictions had been placed on when the boy could be seen by his parents in hospital, and two other children in the family had been temporarily taken from the couple's care. He told the judge he ran upstairs "in a panic" to wake his partner and call an ambulance. Judge Willans said there had been no previous concerns raised about the couple. He said he accepted the man's account. "I find the father raced up the stairs in close to a blind panic," said Judge Willans in his ruling. "He had one motivation and that was to get (his son) to his mother for help." The judge said the baby's exact positioning had not been at the forefront of the man's mind. "His head was, or quickly became, unsupported," said the judge. "The process of moving up the stairs produced sufficient flexion/extension and lateral movement which when applied to (the baby) caused the necessary alarming movements of his head and with sufficient force and duration to damage him." Judge Willans said "with hindsight" the man had made the "wrong decision". "Can I really conclude that no reasonable parent would have acted in an equivalent manner?" asked the judge. "The answer is no. "There is no basis for believing these findings constitute grounds for continuing concern. "My findings do not amount to criticism of him. With hindsight he made the wrong decision. Hindsight is a wonderful thing but was not available to the father that morning. "This family have been torn apart by what happened."